Canon officially presents the EOS 650D, a new 18 megapixel hybrid CMOS sensor model with DIGIC 5 processor, a 3" vari-angle touchscreen, and 100-12,800 ISO range. It iwll ship next week for 849EUR (incl. VAT). Canon today launches the EOS 650D – a new, easy-to-use Digital SLR (DSLR) that offers high image quality and simple touch-screen operation, allowing anyone to capture beautiful images and Full HD movies. Ideal for photography beginners, the EOS 650D combines intelligent automatic shooting modes with a range of advanced features – making it easy-to-use today, with a full range of manual modes to explore tomorrow. The EOS 650D is the first-ever EOS to feature a dual AF system, which ensures exceptional detail in stills and continuous autofocus tracking when shooting movies. At the camera’s heart is an 18 megapixel (MP) Hybrid CMOS sensor and powerful DIGIC 5 processing, enabling the capture of sharp, full resolution images at up to 5 frames per second (fps). A Vari-angle capacitive touch-screen also makes camera operation quick and easy, providing instant access to an extensive range of settings and scene modes. 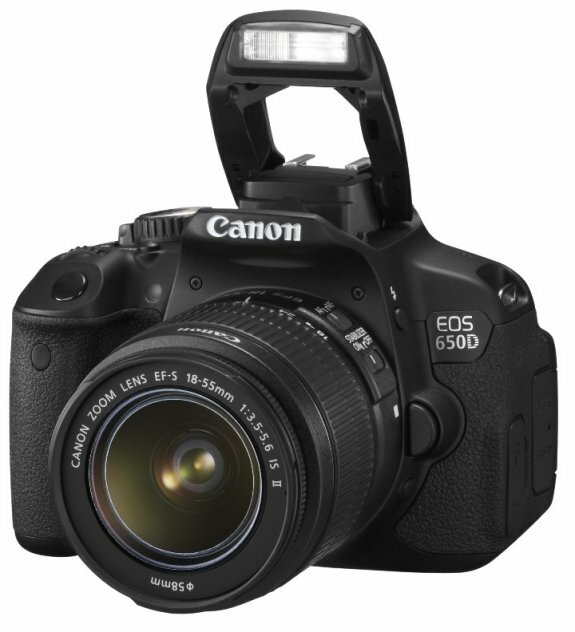 The EOS 650D offers outstanding image quality and performance. Its newly-developed 18 MP APS-C Hybrid CMOS sensor provides super-fine resolution, capturing poster-sized images that are rich in colour and detail. Ideal for shooting in low light without flash, the camera features a native 100-12,800 ISO range, allowing the capture of natural-looking shots with minimal noise, while an expanded ISO 25,600 range also offers the ability to shoot in more extreme low-light conditions. The EOS 650D is the first entry-level EOS to be powered by Canon DIGIC 5 processing, offering greater speed, responsiveness and advanced colour rendition. DIGIC 5’s 14-bit image processing provides beautiful and subtle transitions between colour tones, such as those of an evening sky, and its vastly-increased power also makes the camera ideal for capturing fast-moving action such as football or other sports. The new dual AF system makes it easy to capture sharply-focused shots of all subjects, whether capturing stills or movies. A superior 9-point all cross-type AF system provides exceptional performance during stills shooting, offering precision accuracy when capturing sports, action and wildlife. Additionally, a new Hybrid AF System offers continuous autofocusing during movie recording, and when shooting in Live View mode. Getting the perfect shot has never been easier thanks to the new 7.7cm (3.0”) Vari-angle Clear View LCD II Touch screen. Featuring capacitive technology, the screen is highly responsive and supports a variety of multi-touch gestures, such as pinching and swiping – making it easy to access shooting modes, alter settings and even capture a shot using the screen alone. Touch control adds a different dimension to Live View shooting. You can select AF points, track faces and objects, and fine-tune image settings via the camera’s Quick Control screen. Navigation is instant and intuitive, while pinch-zooming in playback provides a great way to check the finer details of a shot. The Vari-angle hinge allows the screen to be angled and tilted to suit virtually any situation, while a super-sharp 1,040k-dot resolution ensures every detail is clearly displayed. The EOS 650D makes it easy for anyone to shoot Full HD (1920x1080p) videos. Thanks to Hybrid AF, users can focus exclusively on story-telling while the camera continuously tracks the subject. New EF-S 18-135mm f/3.5-5.6 IS STM and EF 40mm f/2.8 STM lenses are also ideal for shooting videos, utilising a virtually-silent stepper motor to ensure movies are smoother and clearer than ever. With Video Snapshot mode, anyone can create fun, fast-paced videos with a professionally-edited feel. Snapshots can be recorded in two, four, or eight second segments, and then combined or reordered in-camera ahead of playback. An integrated mini-HDMI port also makes it easy to share the results on any HDTV. Two brand new shooting modes located on the mode dial help beginners to shoot confidently in difficult lighting conditions. HDR Backlight Control tackles tricky, brightly-backlit scenes by capturing three different exposures – under, correctly, and over-exposed – and combining them into one HDR image displaying both highlight and shadow detail. Handheld Night Scene, meanwhile, makes it easier to capture beautiful low-light evening shots with no tripod, rapidly shooting four different images before combining them into one detailed, blur-free picture. The camera’s range of shooting modes also allows you to explore the boundaries of your creativity. Basic+ allows you to go beyond basic automatic settings, with a range of presets you can use to dramatically and instantly alter the mood of a shot. Canon’s fun range of Creative Filters can now be applied to images using the Touch-screen, with new ‘Art Bold Effect’ and ‘Water Painting Effect’ offering more ways to apply a creative twist to a shot. If you simply want to point and shoot, Scene Intelligent Auto mode does the work for you – analysing the scene and automatically selecting the best settings, so you can take great shots out of the box. As part of Canon’s EOS system, the EOS 650D is compatible with the world’s most comprehensive selection of lenses and accessories. Over 60 EF lenses cover everything from wide-angle and macro to extreme telephoto, and countless accessories provide the tools to meet virtually any creative challenge.